Enjoying the landscape in your yard is all about highlighting natural elements such as color, fragrance, and sound. 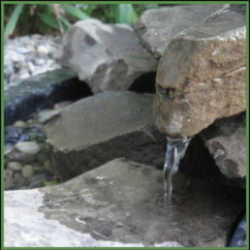 One element not naturally present in most yards is the natural sound of trickling water. Fortunately, there are myriad ways you can welcome the water element into your yard via fountains and water features in all shapes and sizes. With pre-bought and DIY options, there are water features for every type of landscape and every budget. 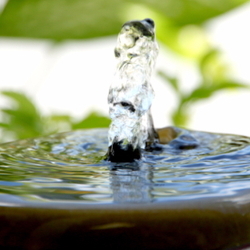 Here are some things to consider when planning the addition of a water feature for your yard. There are as many different sounds of water falling as there are types of fountains. One general rule of thumb is that the larger the fountain, the louder the noise. More specifically, the further the water drops, the louder the rush will appear. You will have to decide the level of noise you are looking for. If you want a subtle addition to your zen garden you may just want a tabletop feature nearby. On the other hand, if you’re hoping to drown out the noisy neighbors, you might want to incorporate a large water feature or even install a few in different areas of the yard. One of the reasons there are so many options when it comes to water features is that they can be made out of nearly any material. Different materials offer different sounds so you’ll want to consider that as well. If you think about it, you can distinguish whether the rain is hitting metal or plastic so use that same knowledge when selecting materials. Whether you make your own water feature or select one from a local vendor, think about how the different materials will hold up in the weather conditions in your area. 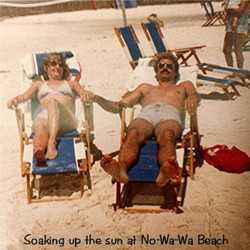 For example, plastic may fade or even melt under a hot sun. Metals are likely to tarnish, especially in areas with a lot of moisture. Stone is reliable in most environments but is also very heavy, making it difficult to move from one place to another. You can even make your own water feature out of scrap metal, wine bottles, flower pots, or wood barrels. Another important consideration for your water feature is size. The idea of a water feature is to provide the sounds of nature as well as visual appeal so it’s important the size fits into the elemental design of your yard. After all, you don’t want your Buddha fountain to overtake your small patio garden. Similarly, you don’t want to lose your dainty ladybug fountain under the canopy of thriving sunflowers. Consider the height, width, and weight of the feature to make sure it accentuates the plant options or patio decor around it. Most fountains are powered by a pump. Small tabletop fountains can be plugged directly into the house while the spraying fountain in the middle of the pond will likely require its own electrical box nearby. When calculating placement of your backyard fountain, think about how it will receive power. Will you need to bury cable? If so, you may need to route it under grass rather than concrete. At this point, you may need to add another circuit breaker in your panel or even hire a professional to run the electrical to your pond or other large water feature. Some fountains come equipped with solar technology that avoids the use of electrical plug-ins and cords running through the yard. The internet and the local garden center are teeming with water feature options. Prices range from under $20 up to thousands for a major water feature. You can select from tabletop, column-style, washboard look, Greek gods, multi-tiered, or even waterfalls. As someone who loves to spend time in the garden, creating your own water feature might be another way to personally invest in your yard. There is literally no end to the combination of fountains you can create, typically with supplies you have on hand. The most important thing to realize about making your own water features is that at their core they are all made the same way. Any waterproof material that water can run through or over will do the job. Buckets, barrels, sheets of metal, terra cotta pots, bottles, jars, and rocks are all examples. You will also need a reservoir at the bottom of the fountain. This is where the pump draws the water from. Any water-proof container will work but you will want to match the capacity with that of your pump so that it is not trying to draw more water than you have in the reservoir. Now comes the creative part. Play around with different ways you can tier or stack the materials you chose into an interesting and functional design. For example, have one terra cotta pot pour into another that pours into one below that. Imagine the water falling from the top so you can build the functionality of your design. During this step, you are just visualizing the placement of the materials. The pump should be placed into the reservoir so you can ensure the water will be deep enough to cover it and provide effective pumping. Then attach the hoses or pipes that the water will flow through to the top of the fountain. The materials you use for this depend on what you have available and how big the fountain is. In any event, the technique is the same - the pump pushes water up the hose or piping to the top of the fountain and then the water cascades down the tiers of the fountain back to the reservoir in a continual motion. Even in a pond, the process is the same with the pump driving the water up the piping and out the top of the fountain. With your reservoir, pump, and hoses in place, it’s time to place the pieces. Drill a hole in the first material that the hose reaches. You can insert the hose and glue it into place. The idea is to keep the functional components hidden as much as possible, so cover the hose with moss, rocks, or the materials themselves by guiding the hose up through the middle. Glue or otherwise mount the rest of the pieces into place. With your DIY fountain complete, plug in to power and give it a trial run. You may need to make adjustments to the pump or the reservoir size if it produces too much or not enough water. You can put your water feature on a timer or leave it running continually, but remember that fountains need cleaned periodically to remove slimy build-up and blockages from the filter in the pump. Dawn Hammon has thrived in freelance writing and editor roles for nearly a decade. She has lived, worked, and attended school in the lush Willamette Valley in Oregon for many years. Dawn loves the long mild seasons of the area where she can grow produce for home canning and fresh consumption. She grows hops for homebrew, has an expansive herb garden, and fills the freezer annually with fresh seasonal berries from her yard and surrounding areas. Her multiple interests have led her to frequently undergo home improvement projects both inside and outside the house. She enjoys sharing the hard-earned knowledge that comes with it with the audiences of www.DavesGarden.com and DoItYourself.com. Plus her copious time in nature has taught her much about native plants and wild edibles, information that she has shared at www.GearWeAre.com. Tapping into her enthusiasm for the environment and devotion to sustainable practices, Dawn has recently launched a passion project aimed at connecting eco-friendly products and socially-responsible companies with consumers interested in making conscientious purchases, better informing themselves about products on the market, and taking a stand in favor of helping save the planet. You can find out more on her website www.topecodeals.com. When she is not providing stellar online content for local, national, and international businesses or trolling the internet for organic cotton clothing, you might find her backpacking nearby hills and valleys, traveling to remote parts of the globe, or expanding her vocabulary in a competitive game of Scrabble.